UPDATE (19th November, 13:01 GMT): the price of bitcoin reached $900 on Mt. Gox at around 01:15 GMT, with the highest price recorded on BTC China being 6,989 CNY ($1,147) at around 01:00 GMT. The CoinDesk BPI reached $781 at 01:13 GMT. 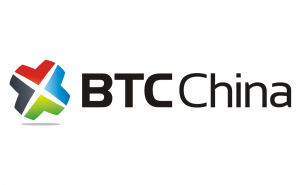 The price has now dropped, though, with BTC China showing 4,000 CNY, Mt. Gox showing $670 and the CoinDesk BPI showing $575. UPDATE (18th November, 22:45 GMT): the price of bitcoin reached $750 on Mt. Gox within the last hour-and-a-half. The highest the price reached according to the CoinDesk BPI was $636 at 21:28. This price increase coincided with the Senate hearing about bitcoin, in which the pros and cons of digital currencies were discussed. UPDATE (18th November, 13:45 GMT): in the 24 hours since this report, bitcoin has topped even $600 on Mt. Gox and is hovering just above and below that point. Traditionally lower-priced exchanges Bitstamp and BTC-e passed the $500 mark in the same time, creating a difference of over $80. CoinDesk’s Bitcoin Price Index has the current price at $526. 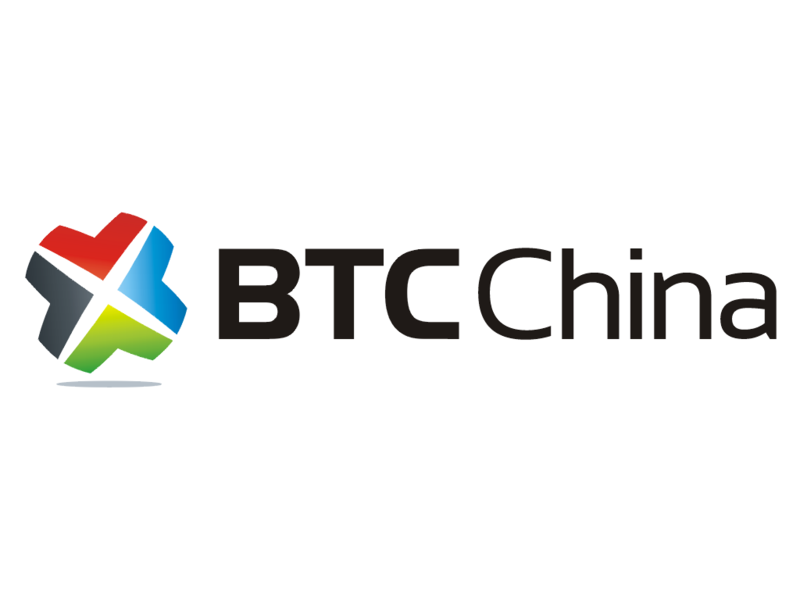 BTC China, now the world’s largest bitcoin exchange by trade volume, actually saw the value reach a US dollar equivalent of over $640 for a brief period, and it remains higher than any other exchange. Those bitcoins that made you gasp at $300 just a couple of weeks ago? They were a bargain — the value of 1 BTC has now passed $500. Prices hit this record and landmark figure at 11.50am GMT on 17 November, and at the time of writing were trading at $503.10 on Mt. Gox. That means: if you bought a stash of bitcoins at their absolute highest peak price of $266* in April 2013 and then felt nauseous as the price plunged to $65 the same week, you have now almost doubled your investment. Provided you didn’t cut your losses and sell prematurely, that is. The bitcoin value began rising again almost immediately after that, breaking through the $100 mark again before May and hovering around that region throughout the northern hemisphere summer. It broke through $200 in late October and since then the price charts have been close to vertical, hitting $300 on 6 November and $400 on all exchanges by 15 November. There are currently 12,003,175 bitcoins in existence. The total market cap is $5,581,140,286 according to the Bitcoin Price Index, with 1,212,833 bitcoins changing hands in the past 24 hours. An average of 50,535 bitcoins are transacted every hour. Bitcoin has survived some bumps in that time, most significantly the shutdown of the Silk Road online black marketplace and a number of chilly statements from government representatives. That it has continued to rise despite these setbacks could well be pushing values even higher, as investors sense a more resilient asset than previously thought. 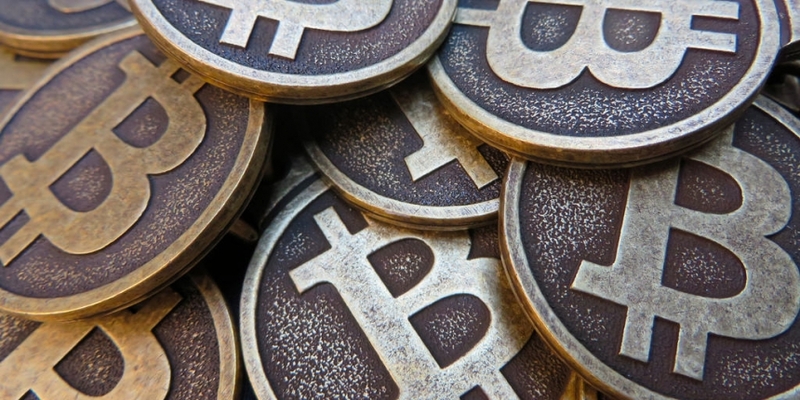 The FBI seized a total of 171,955 BTC from Silk Road in October 2013, an amount so significant there were rumors it could influence bitcoin’s value. It is still unclear what the Bureau intends to do with its haul, if anything. An asset with more significant value has also meant higher-profile hacks, scams and thefts. Companies like Australia’s Inputs.io found themselves out of their depth as its now considerable deposits came under attack. What had been worth a few thousand in 2012 was suddenly worth millions, and people with plenty of experience finding naive security holes wanted it. Rather than face their customers’ wrath, the proprietors of such businesses simply took fright and ran away. As recently as last week, the (supposedly) Hong Kong-based GBL also disappeared, along with its customers’ funds. Yet the value never fell. Nearly every piece of bad news about individual cases heralded more expectations that bitcoin would pay the price. That it has continued to rise despite these setbacks could well be feeding back and pushing values even higher, as investors sense bitcoin is a more resilient asset than previously thought. The government has been paying as much attention as the hackers and scammers. The US Senate Committee on Homeland Security and Governmental Affairs (HSGAC) will begin hearings on Monday 18 November with representatives from five wary federal agencies and representatives from the bitcoin advocacy community. Another Senate Committee on Banking, Housing and Urban Affairs will also hold a bitcoin hearing on Tuesday 19 November. Again, the news of these hearings have had no negative impact on bitcoin’s value. 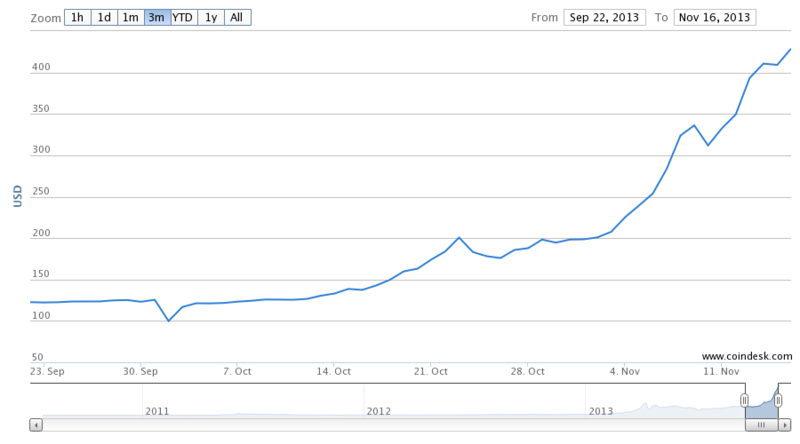 Silk Road’s shutdown on 2 October 2013 caused only a small dip in the bitcoin price. Late 2013 also saw an axial shift towards Asia, as BTC China became the highest-volume bitcoin exchange with its own record-setting prices. Reports of media attention and rampant mining activity have made some wonder if China is driving the rise. Even in April, when most gave credit for the bitcoin rise to government bank account confiscations, the factories of Shenzhen were busy cranking out mining hardware and selling it to locals. The two week shutdown of the US Federal Government in October 2013 over a debt ceiling dispute did little to boost faith in government-backed money, especially the one acting as the world’s reserve currency. Every time the word ‘default’ is even mentioned in this context, no matter what the expected outcome, eyes begin to search for alternative assets. There have been other alternate theories, including the one that bitcoin value is being driven up by the unfortunate millions desperately acquiring the currency to rid themselves of CryptoLocker malware. The air in April was thick with the gloating of digital currency cynics and attempts even by technology media to analyze the factors behind bitcoin’s ‘fate’ and look for alternatives. But bitcoin has proved to be more Amazon.com than Pets.com and if it’s a bubble, it is one with a tendency to respawn. Now, as $1,000 will get you only two bitcoins, the cries of ‘bubble!’ have not gone away. Garrick Hileman, economics historian at the London School of Economics, said it’s too early to tell whether we’re seeing a bubble in bitcoin. He believes lots of factors are driving the price increase, including pure speculation, increased media coverage and attention from regulators. Hileman said the US Senate hearings next week will not only bring more publicity to bitcoin, they may also lead to additional regulatory guidance. “The lack of legal clarity is arguably the single most important issue facing bitcoin right now. For example, banks are scared of bitcoin, and reluctance by banks to work with the growing bitcoin ecosystem is a significant barrier to wider adoption,” he added. Suggestions of a bubble will probably continue to increase and it’s wise to not get to carried away simply by a rising price. It might be equally prudent to stay ready to pounce on another price drop to $65. Or we may be laughing at this story a year from now — not because the price has crashed, but because it has soared to even more unimaginable levels. Someone from November 2012 would probably find the idea of $500 quite hilarious too. * Prices on BTC China were actually over the equivalent of $300 in April 2013, but the exchange trades only in Chinese RMB.